When you’re out with your little one, you’ll need all your nappy changing essentials in one bag, so you can just pick it up and go. 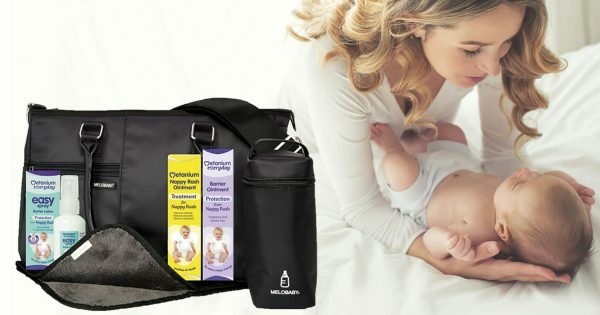 That’s why Metanium is giving 4 lucky readers the chance to win a MELOBABY Luxe Noir Twill Melotote Changing Bag (RRP £75). Metanium is also throwing in its Everyday Easy Spray Barrier Lotion (ideal to keep in your changing bag to use when you’re away from home). Metanium Everyday Barrier Ointment has a unique double action formula to provide daily protection from nappy rash and is gentle enough to use every day and at each nappy change. It’s also available in a handy Spray. Double action Metanium Everyday Easy Spray Barrier Lotion protects and moisturises the skin to help prevent nappy rash. For your chance to win, answer the question and leave your details before the closing date of Monday 28th January 2019. Good Luck!